When the Grand Rapids Comic Society formed two years ago, they dreamed of assembling an anthology, to be able to say, Look, Grand Rapids! We have a comic scene, and we are the artists. To find out when and where meetings are, leave a note on the society's Facebook page or shoot them an email. 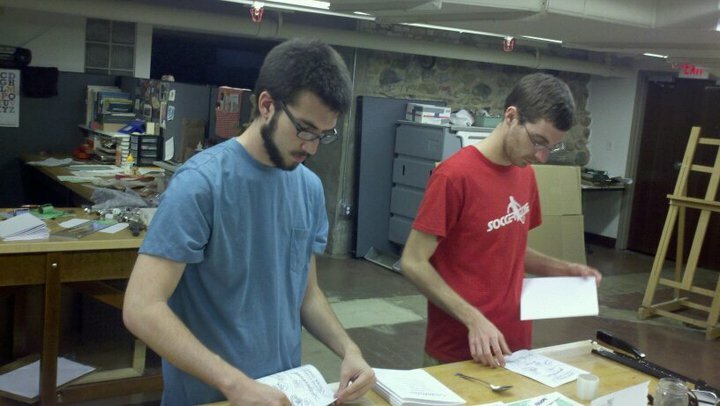 Society members Drew Damron (L) and Brian Boss (R) assemble zines. 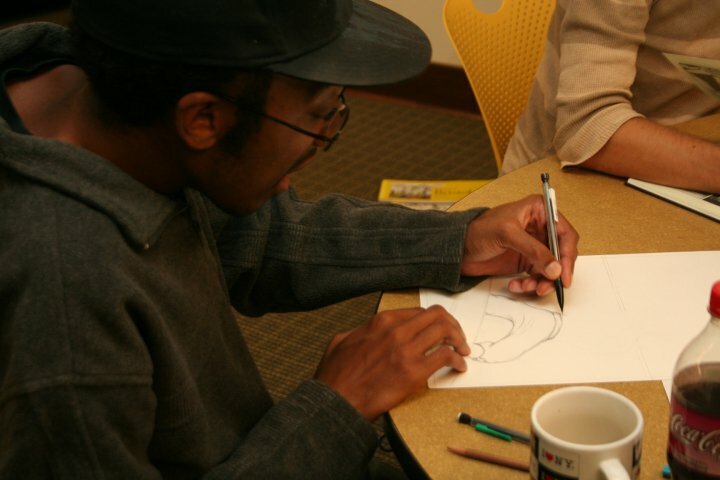 Member Damon Crawford works on a piece during the biweekly meetup. When the Grand Rapids Comic Society formed two years ago, they dreamed of assembling an anthology to be able to say, "Look, Grand Rapids! 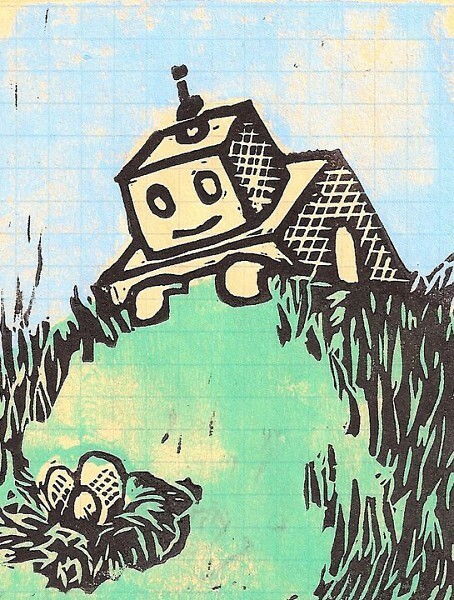 We are establishing a comics scene, and we are the artists." This Thursday at 6 p.m. at The Sparrows Coffee, Tea and Newsstand (1035 Wealthy SE), members of the comic society will debut their first collection. The hand-bound zines are a collaboration among six artists to turn out four graphic stories in 24 pages, complete with hand-stained covers. Drew Damron was part of the push to pull together the collection. He is one of the society's first members from back when it was called the Grand Rapids Comics Roundtable. Damron has a voracity for comics and began drawing them a few years ago. "I looked around and there wasn't anywhere to go to show people what I was working on," he said. With local illustrator Matt Reidsma, they emulated the comics roundtable in Boston, where Reidsma once lived. Plans for an anthology are currently on the back burner. After the anthology endeavor passed through several hands, Damron decided that at the very least there needed to be a publication. "The only thing that I know how to do is zines in InDesign," Damron said. "We really just wanted to get out there because we've been out there for so long we didn't have any physical thing we could show that we accomplished." He funded a significant portion of the printing with other members chipping in as they could. Proceeds from this collection, priced at $5 each, will fund the next issue. That will come out once the society has enough submissions to merit a second go. Damron wants the comic society to be a launching pad for amateur illustrators, supporting one another and publishing together. Attendance varies, but there are eight core members. "The only thing I knew about comics was Superman and Batman and Tales from the Crypt and none of those interested me; all of those were oriented toward boys. I wasn't very attracted to the art, either," said Rachel Foss, whose artwork is featured in this first collection. She will be starting her Masters of Fine Arts at the Center for Cartoon Studies in Vermont this fall. "Two years ago, a friend of mine knew I was having trouble getting back into art and told me to read Blankets by Craig Thompson. It was a combination of literature and fine art. I didn't know anything like this could exist but once I did, I wanted to learn more." The comic society meets at 7 p.m. every other Thursday, alternating between The Sparrows and Calvin College's 106 Gallery (106 S. Division). Members bring works in progress, discuss visual storytelling and share graphic finds that catch their eye. "We're all just a bunch of people trying to pursue this one art," Foss said. I'd love to purchase one of these compilations off of the society to support this cause/art/scene. What do I do short of crashing their meeting?